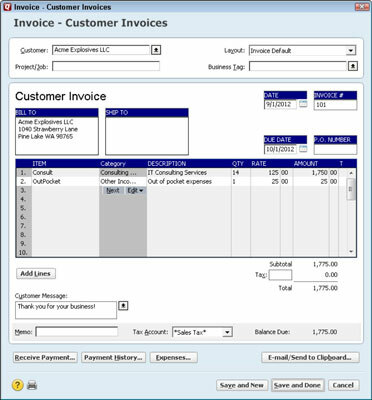 If you’re invoicing a customer for the first time, type his or her name into the Customer box in the upper-left corner of the Invoice window. Quicken will copy the company name to the Bill To box. You can then complete the address by adding the street information, city, state, and ZIP code. Note: Quicken tracks the sales tax you’ve collected using a liability account. Quicken shows the liability account in the Tax Account drop-down list box at the bottom of the window.